On Tuesday we went to see Mr. Holmes at the open air cinema. The previous two evenings we’d turned up, only to find the advertising posters had been a little Greek tease. Anyway we sat amongst a sprinkling of others in comfy director’s chairs and enjoyed the breeze-born aroma of grilling meats and fish from tavernas around the bay. It was just the morsel of culture we needed and the film’s location was a feast in itself…an old farmhouse with rambling gardens full of overgrown shrubs and flowers. The souvlaki scent around us soon faded and was replaced by a sumptuous lift of jasmine which settled as the garden scenes tumbled onto the screen. A good memory, which reminded us of last autumn on Milos when two chaps headed purposefully across a near-deserted beach to talk to…the dog! We discovered that one of them was the location director for Sherlock. Wednesday provided a goodly wind to transport us across to the Cyclades again and we anchored off Kezzie’s favourite beach where she performed her greyhound impersonations and ran the cabin fever out of her little limbs. This time it was an eminent university professor who introduced himself…to her! The chat usually settles on the subject of boatyards, cradles, cranes and overwintering at this time of year so we were happy to pass on details of Rope Sole’s winter home. All this reminded us of another encounter, in the Spring. 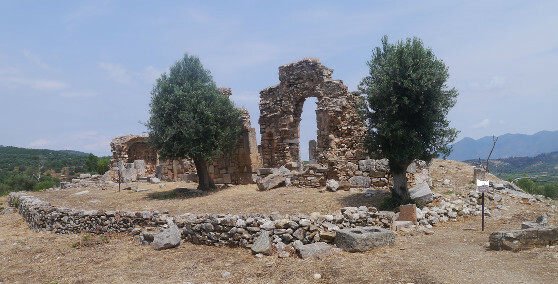 We had driven along a beautiful fertile valley and up into the hills, following a sign to an ancient monument. A much rutted track ascended us to a random scrap of scrub upon which we parked and set off to discover the site. 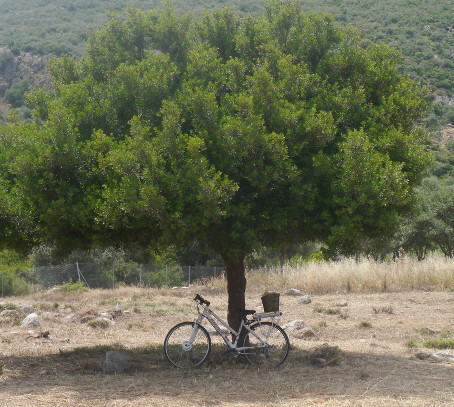 We walked past olive trees under which a couple of labourers were using sickles to gently swipe the undergrowth, their bicycles propped against a fence post, ah we could see bulging saddle bags! Suddenly we found ourselves stepping on a grid of ruined foundation stones, ancient gullies and all sorts of others. In the distance were the pillared remains of a remarkably in-tact temple or palace. The whole clearing was hot, deserted and overlooking the valley of orange trees and sea beyond. Breathtakingly unexpected. Having no idea what we’d stumbled upon we ambled back, in search of water from the car. In the distance we waved at the two gardeners leaning against their trees, clearly enjoying a munch break. Suddenly, from absolutely nowhere another man appeared, as though he had been ‘beamed in’. He had a loosely..Mr. Holmes meets university professor look about him and was, with arms moving gently, simply gazing all around. He quickly enlightened us, somewhat shocked by our ignorance. ‘This is the birth place of Theseus’ he exclaimed. I have been writing an opera based on his life ….for 40 years.’ From beneath his floppy hat a broad and generous smile turned and shared the moment, ‘I’m in seventh heaven!’ He declared. We had strolled into the pleasure of a Hungarian composer of operas and this was his life’s work….the moment we shared was his first-footing of the site. Clearly he wanted to be alone so we turned to go but, ‘where will your opera have its debut? ‘We couldn’t help but ask. The answer was rather sad, he’d shown the work to an Athenian musical society who made him an honourary fellow and might perform some excerpts. ‘There will be no money for me though’, he sighed. We found our water bottles but there was nothing to indicate how our Hungarian friend had travelled to his hero’s spot. He must have walked. Later we read of Theseus’ life….crumbs it’s not surprising it took him 40 years to write the opera…it might be a long performance.